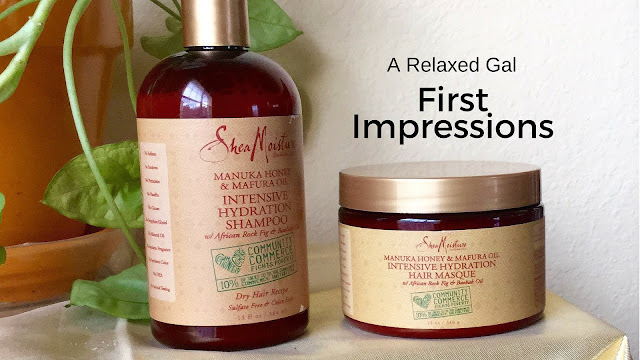 As promised here are my first impressions of the SheaMoisture Manuka Honey & Mafura Oil Intensive Hydration Shampoo and Hair Masque that I bought a few weeks ago. You can also check out my first impressions video to get more details on what I think about both products. I have naturally dry hair so when it comes to hair products I like to try ones that talk about moisturizing and hydration. So when I first saw and read about this line from SheaMoisture I was so excited to give a try. I've used the shampoo on my relaxed hair only once but so far I am not impressed. I felt that the consistency of the shampoo is nice. It's not overly thick and not runny. But it didn't lather easily for me like other SheaMoisture shampoos have. For me, I prefer a shampoo that lathers. If there's no lather I don't feel like it's cleaning anything. After using the SheaMoisture Manuka Honey and Mafura Oil Shampoo my relaxed hair didn't feel moisturized or hydrated at all. It felt stripped of moisture actually. Like the shampoo took away all of the moisture my hair had before I used it. I've used the hair masque twice and liked it better the second time around. Probably because I used it on dry hair as a pre-poo instead of following the directions like I did the first time. The hair masque is very thick. I can hold the jar upside down and nothing comes out. While I like thick hair masques I'm not that crazy about this one because it has a putty feel and a hint of a putty smell. The one thing that stood out to me about the SheaMoisture Manuka Honey & Mafura Oil line is the smell. It's not unpleasant it's just different than what I'm used to. Most of my hair products have a fruity or flowery smell. The manuka honey products don't. They have a more musky, earthy smell. The jury is still out on both products. I plan to continue using them so they will be popping up in future wash day posts. Once I've used them a few more times I'll share more detailed product views. 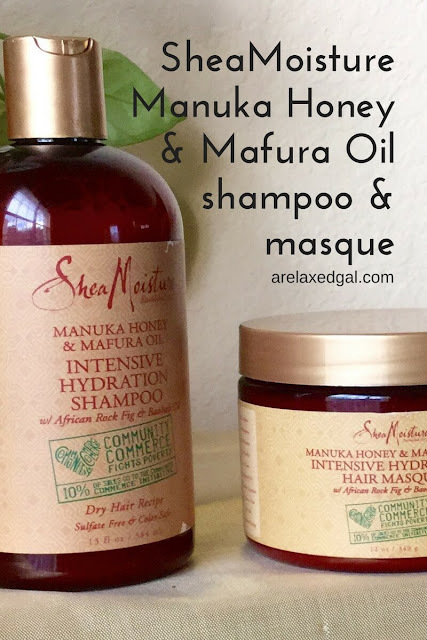 Have you tried any of the SheaMoisture Manuka Honey & Mafura Oil products?